It is important to plan ahead to ensure you don’t overspend. We all have our financial limits and there are many ways to make sure you are staying within your budget this summer. Sticking to a strict budget during the summer months can be hard to accomplish. With the nice weather, it is easy for consumers to veer off their financial track. National nonprofit American Consumer Credit Counseling (ACCC) provides consumers with tips on how to enjoy summer on a budget. According to NerdWallet’s2018 Summer Spending Report, 81 percent of Americans planning to go on vacation this summer expect to charge an average of $1,019 on their credit cards. Parents are expecting to pay an average of $471 per child for summer activities, including camps, sports, and other activities. 1. Pay in cash. Consumers usually spend less when they use cash because they can see exactly how much they are really spending and have time to weigh the pros and cons of each purchase. 2. Plan ahead for unexpected spontaneity. When creating a budget at the beginning of each year, consumers should make sure there is room in their budget for unplanned summer activities. 3. Set up direct deposit. By setting up direct deposit, consumers can automatically pay their bills so they don't have to worry about late fees if they take a vacation! 4. Plan to purchase ahead of time. The closer the event, the more expensive flights get. By purchasing tickets in advance, consumers can save a boat load of money. 5. Set a social calendar and stick to it. By planning, the likelihood of an unexpected social expense or trip lessens. 6. Utilize the outdoors. 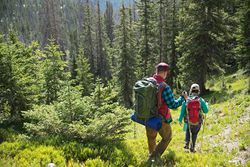 Camping, hiking, and other outdoor activities are all great ways to help minimize expenses while still having fun on a budget. 7. Budget Utilities. Utility costs often increase during the summer due to air conditioning usage. Be sure to remember to turn off the air conditioner when it is not needed. 8. Look for free events. There are always free events happening during the summer months and attending them will allow consumers to stick to their budget while still having fun.